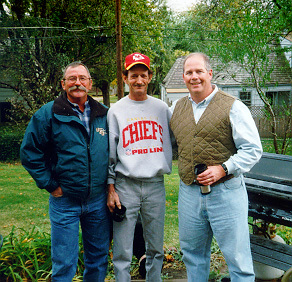 This photo was taken Nov. 2, 1997, on Roch Thornton’s back patio in Overland Park, Kan. That was the weekend of the first CAP 2 “reunion” attended by those of us in this photo, plus Robert “Doc” Hipple, and our wives. Left to right, we are Ken Duncan, Dennis Prock and Roch Thornton. In the summer of 1970, five of us Marines in CAP 2-7-2 planned a reunion. Our plan was simple. We would meet at noon exactly five years to the day after the end of the Vietnam War. We would meet at the corner of Haight and Ashbury streets in San Francisco. We would all wear pink shirts, to be sure of recognizing each other (we expected to have long hair, maybe beards).Why pink shirts? We couldn’t imagine any piece of clothing that screamed “CIVILIAN!” louder than a pink shirt. We wanted to be civilians. I even had a pink shirt custom-made for me while I was on R&R in Hong Kong. After meeting, we planned to get drunk, get high and get laid — not necessarily in that order. Give us a break. We averaged about 20 years of age. It never happened, naturally. Nobody showed up at Haight and Ashbury because nobody knew when the war ended. There was nothing like V-E Day or V-J Day in World War II. Did the war end with the signing of the Paris Peace Accords in 1972? Did it end with the departure of last U.S. combat troops? Did it end when the last helicopter lifted the last American off the roof of the U.S. Embassy in 1975? How about when the POWs came home from North Vietnam? Tell me when the Vietnam War ended. Maybe we would have met in San Francisco, at least a couple of us, if there had been a V-Vietnam Day. Maybe not. We were scattered to the four winds long before 1975. I’m not even positive anymore who the five were. I think they were Roch Thornton (me), Ken “Dunc” Duncan, Dennis “Erp” Erpelding, Dennis “Huck” Prock and Nelson Kilmister. Ken, Huck and I finally had our reunion in Kansas City on Oct. 31 and Nov. 1-2, 1997, along with our wives and some of our children. We had a great time, though we’re middle-aged now, celebrating our survival and talking about old friends and the “bad old days.” Another reunion is being planned, and more old comrades will be there — a little more than five years after the end of the war.